The first exposure to cocaine could leave users vulnerable to addiction. Using mice for testing, scientists found that just one single use of cocaine could trigger a long-lasting surge of activity in the part of the brain linked to the development of addiction. And they said this could also be the reason why former drug users fall back into addiction after just one relapse. Drug groups are now hoping to dispel the widely held misconception that cocaine is a safer, less addictive, drug than others. "What's so amazing is that nearly all dopamine neurons are affected by this single cocaine exposure"
A spokeswoman for Addaction said that many drug users mistakenly thought they were safe taking cocaine as a recreational drug, but that this new study proved this was not the case. "It is a general belief that cocaine is less addictive and that this is assumed by users. So it is important to look at this study." But Harry Shapiro, director of communications at the drug addiction group DrugScope, said he would want to see more research before accepting the findings of the research. "Its impossible to make sense of a condition as complicated as addiction from one study, particularly one conducted on mice. There is little correlation between the brain patterns of mice and humans and I would therefore be cautious about placing too much emphasis on a single piece of research." The research, published in Nature, showed that just one single use of cocaine doubled the responsiveness of cells in the brain to the chemical dopamine, which produces feelings of satisfaction and pleasure. Scientists that for up to a week or ten days after taking the drug, the brain was more sensitize to the pleasure of taking cocaine. The research led by a team at University of California, San Francisco's Ernest Gallo Clinic and Research Center, provides the first direct evidence that a single cocaine exposure - a recreational use - causes dramatic changes in the brain to areas that cover learning and memory. DR Antonello Bonci, senior author of the paper and assistant professor of neurology at the university said: "The study shows that the capacity for strengthening connections between nerve cells - the basis for learning and memory - can be usurped by drugs of abuse. "The single exposure appears to hijack the brain's normal molecular mechanisms of memory formation for around a week." Other scientific research has shown that learning and memory are crucially important in the development of addiction and also involve the activation of the same brain cells - the dopamine neurons. DR Mark Ungless, lead author of the paper, said the changes they had found in brain activity were "stunning." "What's so amazing is that nearly all dopamine neurons are affected by this single cocaine exposure. "This kind of response is rare, and would have a profound effect throughout the brain particularly other areas involved in addiction." The researchers said the drug patterns they had found could also apply to other drugs as well as cocaine. They now want to look into how the research can help develop treatments for addiction. A study conducted by researchers from Case Western Reserve University in Cleveland found that children exposed to cocaine before birth were twice as likely to have significant delays in mental skills by age 2, compared to other toddlers with similar backgrounds but whose mothers had not used cocaine during pregnancy. 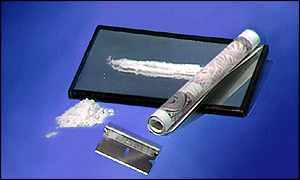 It is probable, according to the researchers, that these cocaine-exposed children will continue to have learning difficulties and an increased need for special educational services when they reach school age. The study, which was funded by the National Institute on Drug Abuse (NIDA), is published in the April 17, 2002 issue of the Journal of the American Medical Association. Dr. Glen R. Hanson, Acting NIDA Director, said, "This study adds important new evidence to a growing body of knowledge. It is the first report of a clear-cut relationship between prenatal cocaine and mental test performance at age two. These findings remind us of the importance of continued efforts to determine which children and families are at risk because of exposure to cocaine, so we can prevent or ameliorate negative consequences of using this drug." He added, "It is important that in this research process, we avoid inadvertently labeling or stigmatizing large numbers of toddlers because of drug use by their mothers during pregnancy. We want to use this type of research to help us be more effective in how we work with these children." The investigators followed the developmental course of 415 infants, whose pregnant mothers were recruited into the study at a large urban county teaching hospital between the years 1994 and 1996. All of the pregnant women recruited into the study were from high-risk and low-socioeconomic status backgrounds. Urine samples were collected from the women and meconium samples were collected from each baby. These samples were screened for maternal drug use. Two hundred and eighteen infants were found to be cocaine-exposed and 197 to be cocaine-free. Each infant was tested for developmental progress at 6.5, 12, and 24 months of age. The infants were administered the Bayley Scales of Infant Mental and Motor Development, a widely used assessment of infant development. Scores on this assessment measure memory, language, and problem-solving abilities, as well as gross and fine motor control and coordination. While no effects on the Bayley Motor Scale were detected, the cocaine-exposed children performed more poorly on the Bayley Mental Scale than unexposed children, after adjusting for other variables (such as use of alcohol, tobacco, or other drugs; maternal age; prenatal care, and home environment quality). Although mental development index scores decreased over time for both groups of infants, children prenatally exposed to cocaine had scores that decreased faster. From 6.5 to 24 months, the average score for infants exposed to cocaine declined by 14 points compared to 9 points for unexposed children. Almost 14 percent of the cocaine-exposed infants had scores in the mental retardation range, 4.89 times higher than expected in the general population. The percentage of children with mild or greater delays was 38 percent, almost double the rate of the non-cocaine-exposed group. Infants of mothers with evidence of higher and more frequent cocaine use during pregnancy fared the worst. Lead investigator Dr. Lynn T. Singer said that there are several possible mechanisms by which cocaine exposure during pregnancy may affect infant outcome. Developing neural systems of the fetal brain may be directly and adversely affected by cocaine exposure. Another possible explanation is that cocaine use during pregnancy may constrict the vascular system, subsequently decreasing blood flow through the placenta and resulting in low oxygen levels (hypoxemia) in the fetus. Differences in the cocaine-exposed infants were noted at birth. These infants had lower gestational age, lower birth weight, and smaller head circumference and length than unexposed babies. There were more preterm, low birth weight and small-for-gestational age infants in the exposed group. There were 11 deaths by the time the infants were 2 years old, 8 in cocaine-positive children and 3 in cocaine-negative children. Sudden Infant Death Syndrome (SIDS) was the leading cause of death in both groups. An estimated 1 million children have been born after fetal cocaine exposure since the mid-1980's, when the so-called crack epidemic emerged with the availability of a cheap, potent, smokable form of cocaine. Scientists have found that a single use of cocaine can modify neural connections in the brain, and this may help explain at the cellular level how occasional drug use can progress into a compulsion. The researchers from the University of California in San Francisco report in the May 31 issue of Nature that a single injection of cocaine induced a long-lasting (between 5 and 10 days) increase in excitatory synaptic transmission in the ventral tegmental area of the brain in rats and mice. The increase in synaptic currents that were activated by cocaine had many similarities to the changes in neural activity involved in learning and memory processes in many areas of the brain. "These findings on the impact of cocaine on the memory and learning circuits of the brain may help explain the switch from occasional drug use to addiction. This study emphasizes the dangers of even experimenting with cocaine and other illicit drugs," says Alan I. Leshner, Ph.D., Director of the National Institute on Drug Abuse (NIDA). "The significance of this finding," says lead investigator Dr. Antonello Bonci, "is that the single dose of cocaine 'usurped' a cellular mechanism involved in a normally adaptive learning process, which may help to explain cocaine's ability to take control of incentive-motivational systems in the brain and produce compulsive drug-seeking behavior." In addition, the researchers said that the changes that were observed in the brains of the rats and mice may be important not just for the early stages of addiction, but also may help explain the neural basis for relapse, where a single exposure to cocaine after a period of abstinence can induce renewed drug-seeking behavior.